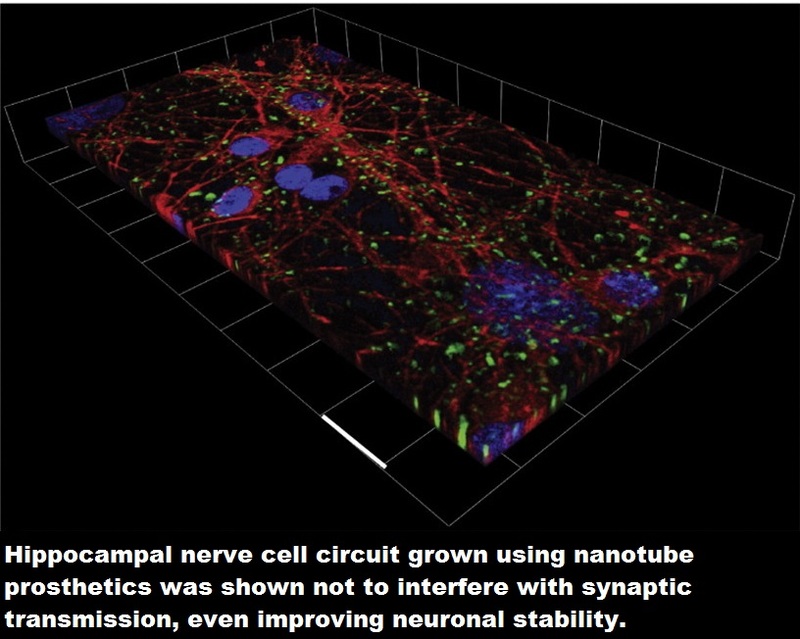 Nano-prosthetics to repair neural circuitry. Neurons are continuously exposed to signals generated by the extracellular environment at the nanoscale to drive key biological tasks. This ability has been exploited to engineer interfaces with nanostructures with the aim of guiding nerve tissue re-growth. Carbon nanotube-based biomaterials contribute to the design of many prosthetic devices, with view to developing novel neural interfaces. Enhancing cell-to-cell communication is crucial in neural circuits’ settings, however interactions between carbon nanotube prosthetics and the cellular surfaces are largely unexplored. Now, a study led by researchers from SISSA shows unprecedented functional integration between carbon nanotube prosthesis and the physiological maturation of the synaptic circuits in cultured hippocampal neurons. The team state their data suggests that carbon nanotubes exhibit ideal biological and physiological compatibility rendering them suitable to re-establish connections between nerve cells, for instance at spinal level, lost on account of lesions or trauma. The opensource study is published in journal Nanomedicine: Nanotechnology, Biology, and Medicine. Previous studies show that neuronal membranes in response to nanomaterials recover even when transiently pierced or deformed by nano-needles or other intracellular nano-delivery systems. Molecular simulations showed that significant changes in the structure of individual lipid molecules were observed when carbon nanotubes were adsorbed on cell membranes and subsequently pierced the lipid bilayer. However, there are no reports on the effects carbon nanotubes interfaces exert on neuronal membrane equilibrium and synaptic transmission. The current study investigates whether carbon nanotube prosthesis, once interfaced to neurons, affects synaptic transmission by modulating lipid membrane structure and dynamics. The current study utilises single cell electrophysiology and immunofluorescence microscopy to monitor the dynamics of synaptic transmission in cultured hippocampal neurons interfaced to carbon nanotube prosthesis. Results show that the nanotube prosthesis do not interfere with the composition of lipids, of cholesterol in particular, which make up the cellular membrane in neurons. The lab explain that membrane lipids play a very important role in the transmission of signals through the synapses, and that carbon nanotube prosthetics do not impede this process. Data findings show that carbon nanotubes perform excellently in terms of duration, adaptability and mechanical compatibility with the tissue. The group state their study also highlights the fact that nerve cells growing on the substratum of nanotubes develop and reach maturity very quickly, eventually reaching a condition of biological homeostasis. They go on to add they show that carbon nanotube prosthetics facilitate the full growth of neurons and the formation of new synapses, and after a few weeks a stable and efficient physiological balance is attained. The team surmise that their data shows carbon nanotube prosthesis interfaced with neurons can regulate synapse formation and function in a dynamic manner, honing neurobiological mechanisms, such as neuronal maturation. For the future, the researchers state that they are now performing studies in vivo with view to repairing neuronal circuitry. MβCD efficiently removed membrane cholesterol without disrupting lipid rafts. 3D confocal reconstructions of hippocampal cultures immune-labeled with the neuronal marker β-tubulin III (in red) and the lipid-raft marker CT-B (in green), in blue DAPI labeling for nuclei. Scale bars 15 μm. Sculpting neurotransmission during synaptic development by 2D nanostructured interfaces. Ballerini et al 2017. Where and when is this treatment available. My son has ms and would love to find something that can help him.